Step 2. Line a baking tray with baking paper and spread the vegetables evenly on top. Drizzle them with olive oil. 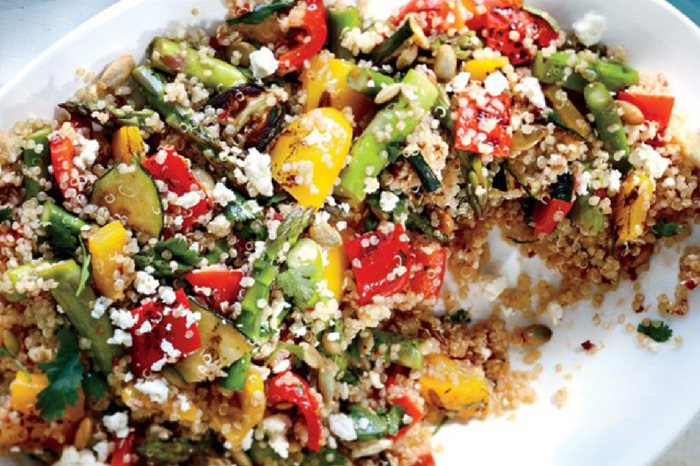 Bake veggies for one hour and then set aside to cool. Step 3. Rinse the quinoa until the water runs clear and drain. Heat a teaspoon of oil in a medium heat saucepan and add the drained quinoa to lightly toast for about one minute. Add the water and bring to a boil. Turn the heat down and simmer, covered, for 15 minutes. Turn the heat off after 15 minutes and let sit, covered, for another 5 minutes. Remove lid after 5 minutes and fluff with a fork, allow to cool.